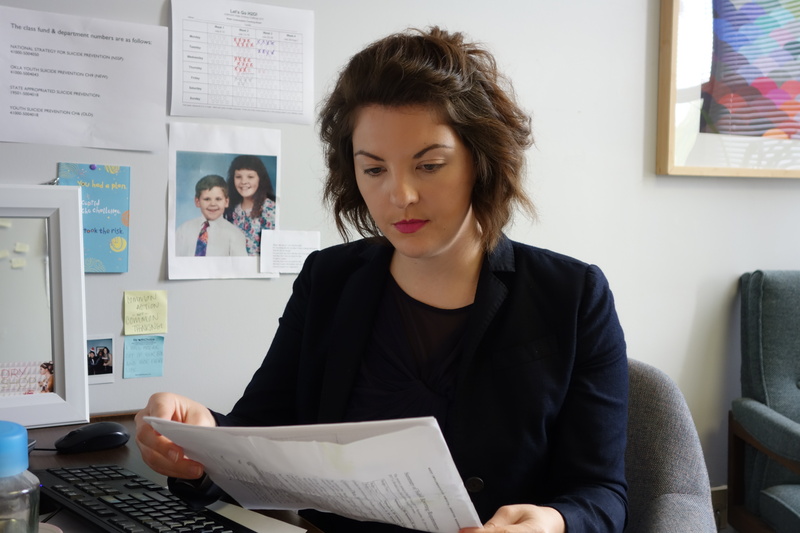 Savannah Kalman leads the state's effort to reduce the prevalence of suicide. Savannah Kalman leads the state’s effort to reduce the prevalence of suicide. One of the paradoxes of Oklahoma is that as friendly as people are, many Oklahomans sink into despair and take their own lives. The state has one of the highest suicide rates in the nation, ranking 13th among states and the District of Columbia in 2013, according to the latest state-level figures from the U.S. Centers for Disease Control and Prevention. Suicide rates in Oklahoma and the nation generally have been increasing for more than a decade, although Oklahoma’s rate dipped slightly in 2012 and 2013. The numbers remain alarming: In 2014, 731 people committed suicide, according to data from the Oklahoma Office of the Chief Medical Examiner. Leading the state’s suicide prevention effort is Savannah Kalman of the Oklahoma State Department of Mental Health and Substance Abuse Services. Kalman is an Oklahoma native. She has a master’s degree in marriage and family counseling and is a member of the Oklahoma Suicide Prevention Council, which assists the state with research, education and prevention initiatives. Oklahoma Watch spoke with Kalman about suicide prevalence and how prevention can make a difference. The interview has been edited for length and clarity. What is the one thing you wish people in Oklahoma knew about suicide? Suicide is a significant issue. The state’s mental health agency shows grim rates of psychological pain in Oklahoma that routinely rank higher than the national average. The problems are complex. The issue is similar to what we encountered with substance abuse. Most people assumed it was personal responsibility. But now we know there are real neurologic components that contribute to the behavior. Some individuals are more susceptible than others. Suicide prevention is at an early stage. The battle continues to diminish stigma related to suicide and mental health issues. Common wisdom says that all the blame falls on the individual and it is his or her total personal responsibility. That is completely false. We’re trying to change the conversation. Why does Oklahoma have high suicide rates? The general thought is that states with lower suicide rates spend more on mental health services, have larger urban populations and less access to things such as prescription painkillers and firearms. States with high rates, especially in western big-sky states, are very rural. People are isolated geographically, which can sharpen emotional isolation. In Oklahoma, part of the problem is that we have high concentrations of at-risk populations, such as Native Americans and service men and women and veterans. And we have a lot of access to opioid prescriptions and firearms. Financial insecurity is also a risk factor. Oklahoma has high poverty rates. In general, I think our environment creates more perfect storms where people feel hopeless and have trouble with access to get effective care. Far more men than women commit suicide. How does that affect prevention strategies? This is a difficult problem that requires ingenuity and creative solutions. The challenge is getting men in Oklahoma to seek help if they are struggling with problems. Over the last decade, men have committed 79 percent of suicides, and more than half of those were by firearm. Depression is the biggest reason, followed by partner problems, mental health and physical health issues. Before we target groups for prevention efforts, we do surveillance work, such as looking at high incidences among groups or areas. These individuals share common characteristics. High-risk regions might include cities near military bases where soldiers and their families live. Post-traumatic stress is common. Or oil workers out in the fields. They often work in an isolated and demanding environment. And to get them to access medical care is unrealistic. There is evidence that men are less likely than women to seek health care and attend annual appointments. The idea of going to specialty appointments for more care just isn’t going to happen. The Air Force successfully implemented a system based on relationships, on developing a sense of shared responsibility, as within a family. We have to train men to help other men in the workplace, to look out for others who are struggling and know where to find available services. We partner offer sessions throughout the state for businesses whose employees could be considered at-risk. Are you doing anything special to reduce suicides by firearm? This is a core piece of suicide prevention. From 2004 to 2013 in Oklahoma, the highest means of death was by firearm. We have trainings and conversations about how to keep firearms safe. We want the public to value gun ownership but also responsibility. Support for legal assisted suicide is increasing in parts of the country. Does that complicate your efforts? We see that as a completely separate issue. The vast majority of people who commit suicide do not have a terminal illness. Suicide, like cancer or HIV, is a health problem. We live in a high-stress world with little perceived control over our environment. We can do a lot of good work if we have a natural boundary system. We have a responsibility to ourselves and our co-workers. We have to find ways to build connections with one another and look out for problems. With prevention, I’m all about outreach. We go to a lot of events in the state and hand out prevention cards. We want to have a presence. For example, at a recent art festival, we had a table and I just spoke to people about what made them happy. The key is that they know someone is available to help them in a crisis. For someone exhibiting suicide warning signs and behaviors, we recommend the three-step intervention called QPR — Question, Persuade, Refer. Question refers to asking an individual are you thinking of killing yourself. Persuade helps the individual to see other possibilities and hope. Refer is to seek immediate help or care. I strongly believe that treatment works and people can recovery to have happy, fulfilled lives. I’m very hopeful for us as Oklahomans. The waiting list for a state program that provides services to Oklahomans with developmental and intellectual disabilities has grown to the highest level it’s ever been.